• Want to know what the Enneagram and the ego are? 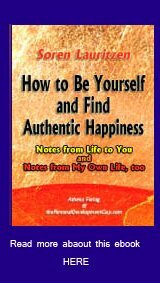 • Find your own ego's type: Get a free Enneagram Test! • Find links to descriptions of the nine different personality types. • Learn to understand yourself and other people better - it helps! What Makes You (and Other People) Tick? Don't you sometimes wonder why other people behave the way they do? Don't you sometimes wonder why YOU behave the way you do? Well, now you can get some extremely precise answers to that. Both you and other people actually behave in a pretty predictable manner. There is a reason for that, and that reason is called the ego. Your ego is a small part of you, a fear-based mental survival mechanism, designed to help you solve problems and get your needs fulfilled. You are identified with your ego. You think and believe that this small part of you IS you and that you are your ego. This, of course, is far from true (more about that later). Egos come in a variety of flavours or types: Nine to be exact. Every single one of them completely predictable. The Enneagram is both a graphical figure and a comprehensive system categorizing 9 different kinds of ego and liberating human consciousness. (The latter is sometimes called 'The Enneagram of Personality'). I use the word to cover both meanings, i.e. when I say 'the Enneagram' I mean both the graphical figure and the system for categorizing egos and liberating consciousness. Everyone has got an ego. You, too. Like I said, this likely makes your behaviour pretty predictable. And since the ego is fear-based, that behaviour isn't going to give you too many pleasant experiences. is teaching you how to get out of the box! Used in this way the Enneagram is a most powerful tool, not only for personal development and self help, but also for spiritual awakening, spiritual enlightenment. If you are only now reading about the Enneagram for the first time, you are in for a very special treat. This system is amazingly comprehensive and you can study it for years and still make thrilling new discoveries on a regular basis (believe me, because I'm talking about myself, here). This system has something to offer almost everyone - from the novice to the very experienced user. 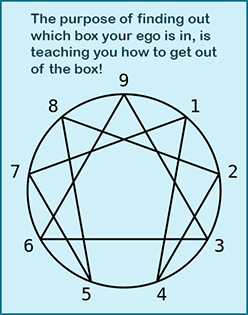 The point of learning all this about the Enneagram and your ego type is to realize which box your ego fits into, so that you may start to work your way OUT of that box, i.e. start NOT acting in the automatic and fear-based way that you have been most of the time up until now. Also, you may use your new knowledge in your relationships (both at home and at work). In essence the Enneagram is a system that describes ego psychology. Understanding other people better is a great starting point for creating better relationships. And you WILL learn how to understand other people better! Both your love partner, your children, your colleagues and your boss. Do you want to keep doing what you've always done and get the same results, or do you want to change your behaviour and get some different results? The first time you realize that your ego would normally have had you do one thing, but you now consciously do another and better thing, well, that just feels SO great! 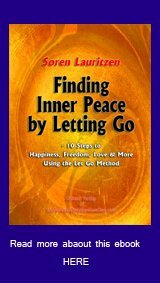 In the end, of course, you may choose to let go of almost all your ego inspired patterns and habits. The long term net effect of this is: great freedom, well being and happiness. In fact, using your knowledge about the Enneagram and your ego can be a path to spiritual enlightenment. This is the best way I know for getting to know your ego. Nine basic types of ego are described, and that includes (among other things) nine ways of thinking, feeling, acting and generally being in the world. So, which one is yours? STEP 1: You can start by taking the Enneagram Test [LINK]. As you do so, please remember that the Enneagram Test is thorough, but by no means final. The same goes for the words and opinions of experts like myself. You, and only you, are the judge of what basic type your ego is! STEP 2: Having done the test, you might continue by reading about your particular type of ego. An e-book or special report [LINK] about the Enneagram (for sale) will be forthcoming, but there will also be some very basic information on this website (see below). If you are up to reading a big book on the subject I'd recommend 'The Wisdom of the Enneagram' by Don Richard Riso and Russ Hudson. 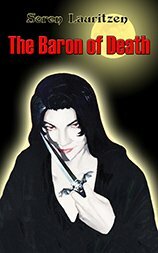 So far, that's the best all round book on the market, although there is actually lots of literature about it. STEP 3: After reading, your best bet is the relationship keys. Because, you see, even though your ego isn't another person, but rather a part of you, you can still cultivate a good relationship to it. The relationship keys are 12 keys that you can use to do this. Probably the most important ones are openness, awareness, understanding and acceptance. If you use those when dealing with your ego, then you'll be well on your way. the teacher, the critic, the judge, the rule-bound person, the idealist. the empath, the creator of intimate relationships, the manipulator, the giver, the special friend. the motivator, the deciever, the chameleon, the succeeder, the workaholic, the I-must-be-the-best person, the producer, the winner. the tragic, the artist, the connoisseur, the lover of uniqueness, the lonely one, the drama queen/king, the creator. the sage, the observer, the thinker, the scientist, the intellectual, the innovator, the expert. the troubleshooter, the questioner, the devil's advocate, the predictor, the pessimist, the realist, the sceptic, the guardian. the epicure, the optimist, the entertainer, the dreamer, the generalist, the scatterbrain, the visionary. the challenger, the confronter, the boss, the protector, the No B.S. person, the dominator, the top dog. the optimist, the ambassador, the keeper of the status quo, the self adaptor, the preservationist, the lover of harmony. Beyond understanding yourself there are countless other applications for this powerful system. One of the most important ones is understanding other people. That makes it so much easier to build good, lasting, conflict-free relationships to them. This is true whether you want to better understand your love partner, your family, your co-workers or your boss. As mentioned this system is focussed on liberating human consciousness, i.e. your consciousness, from the unconscious 'slavery' that comes from being identified with your ego (as exemplified by your Enneagram-type). In other words: The Enneagram can be used as a tool for spiritual enlightenment . There is nothing wrong with having an ego. There is nothing wrong with your particular ego and YOU DO NOT WANT TO FIGHT YOUR EGO! Fighting an integral part of yourself, a part that you have spent years perfecting - a part that also happens to be the most sophisticated defence mechanism in your life ... makes no sense what so ever. No, you'll want to get to know and accept your ego just the way it is, and create an excellent cooperative relationship with it. Your ego is skilled - utilize those skills. Just remember that your ego is a part of you - not the whole you. It is no more the whole you than your hand is the whole you. Your hand is part of you and a tool, and so is your ego. The first step in using the Enneagram to further your spiritual development is getting to know and understand your ego. The second step is remembering the above fact: that you will want to cooperate with, and not fight your ego. The third step is letting your ego tell you of all your needs, all your problems and all the things that it fears. This information is invaluable, for those are the very things that you will want to let go of. Letting go of those things are a direct path to spiritual enlightenment. I have worked with the Enneagram in my coaching and guidance for many years. It has become an invaluable tool. In many cases using this powerful system enables me to help people like you much faster than I would otherwise have been able to. If you would like some personal Enneagram coaching by telephone and/or e-mail, - and if you would like to know more about personal coaching, you can click here.